As we go to press today, Joseph Budna, the Belizean who has been serving a 25-year prison sentence in Guatemala following a conviction for kidnapping and extortion, remains at large. Our checks on Interpol indicated that Budna is not on the list of wanted persons, and Belize’s Ambassador in Guatemala, H.E. Alfredo Martinez, said that they have so far only received a formal notification of Budna’s escape, but no request for assistance in locating him. Guatemalan authorities on Monday morning reported that Budna, 33, had escaped custody. They told Belize’s Embassy in Guatemala that Budna had escaped around 5:30 that morning, and the two prison guards who had escorted him to the Zacapa Regional Hospital were arrested as part of a probe into possible negligence or collusion. In their quest to recapture Budna, officers of Policía Nacional Civil searched buses along the Atlantic Highway. Emisoras Unidas in Guatemala had said that Budna, 33, was recaptured aboard an autobus; however, the Embassy told us that the person who Guatemalan authorities had apprehended was not Budna. The police had the wrong man. Siglo 21, another Guatemala news source, reported that Budna had been at the medical facility since April 11, due to a medical condition which caused hemorrhaging in different parts of the body. As we have previously reported, Budna has another pending trial in Zacapa in March 2014 for a kidnapping and extortion complaint filed by Kevin Fernando Pacheco. 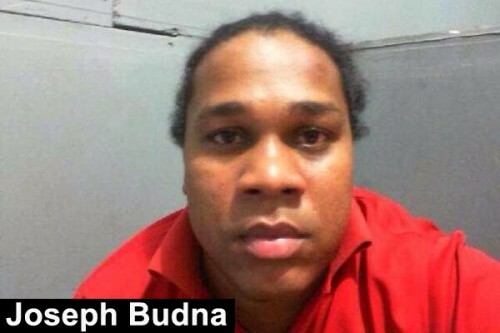 Prensa Libre reported that Budna is accused by police of child molestation and credit card cloning. When Budna was arrested in September 2012, Guatemalan authorities charged that he was the mastermind behind a regional kidnapping and extortion ring operating in Belize, Guatemala, Mexico and Honduras. During court proceedings in Guatemala, however, Budna contended that the persons who were claiming extortion had actually colluded to get money from their parents.